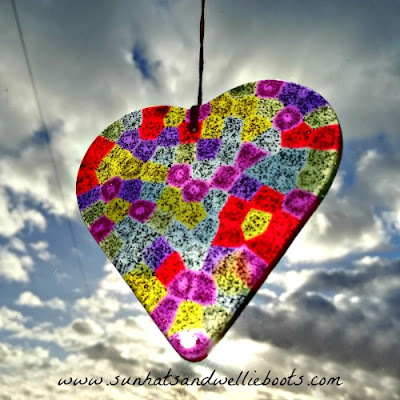 These beautiful Rainbow Hearts are perfect for Valentine's or Mother's Day & fun for all ages to create. I've made them several times now with different groups of children of various ages & they're always a big hit, especially when they see the final result. 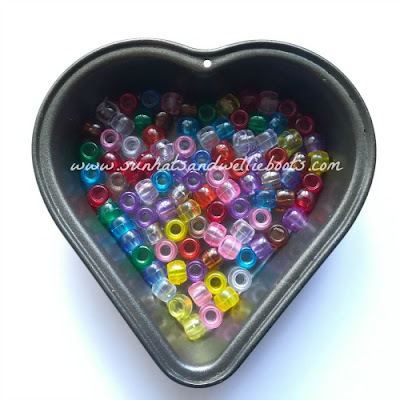 For our Rainbow Hearts we used: coloured transparent pony beads & metal heart-shaped tins (like these). To make the hearts you only need to add a few beads to cover the base of the tin. I love that children can be as random or precise as they wish with the design, some take great care placing every bead to create a certain pattern while others add a random selection. 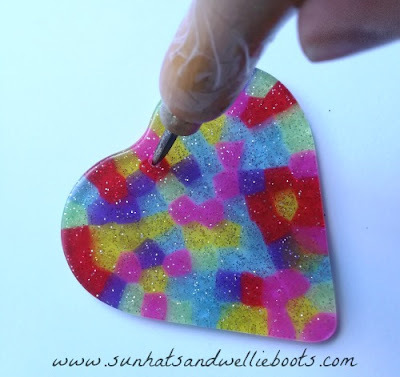 Once your design is finished carefully transfer your heart tin onto a baking tray & into the oven. We use a small oven for this craft which we place outdoors. I wouldn't recommend melting the beads indoors as the smell of the melting plastic isn't pleasant. 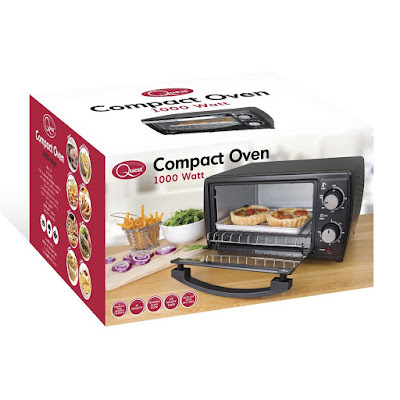 The oven we use is like the one pictured below, & we simply add an extension cable & place it on a flat surface so it's safe to use outside. Once your baking tray is in the oven set the temp to 180°C for around 5mins which should be enough time to melt the beads together. 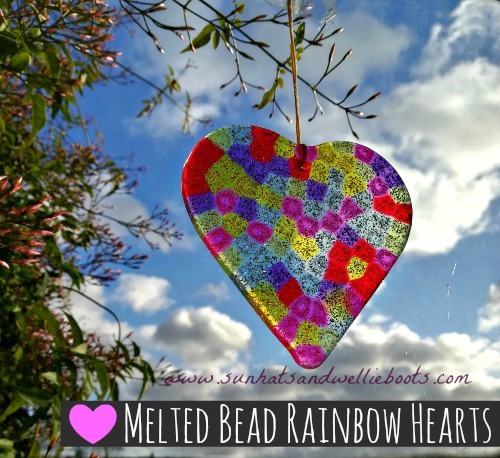 If your beads are not completely melted leave them for a couple of minutes but check them continually. When the beads are flat & fused together, carefully remove the hot tray & leave to cool on a heatproof surface. When cooled, carefully tap the back of the tin & the rainbow heart should pop out! We wanted to hang our heart on a window so I made a small hole in it by firmly screwing a bradawl through the plastic, alternatively you could use a drill, or simply use sticky tape. These look beautiful with the sunlight illuminating all the colours, & the hearts that were made with the glitter beads really do sparkle as they catch the light. 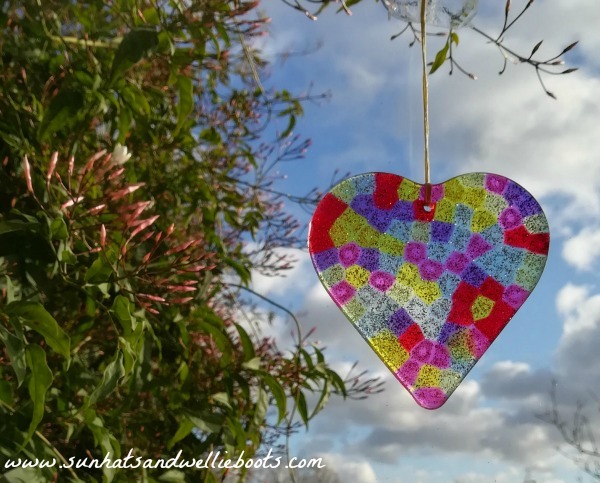 Alternatively, you could use them to decorate your garden & have them hanging outdoors.